Dual-Spindle Heavy Duty Unwinder / Rewinder, the TWIN-CAT-2 has two powerful motors and your choice of core holders. You therefore have maximum versatility in setting up the operation you need. Both spindles can rewind and unwind. You control the direction and torque on each spindle independently. 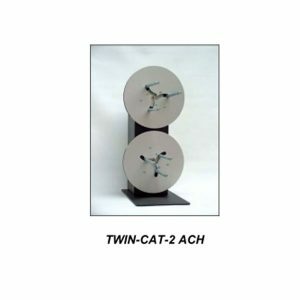 An External Halt Control allows you to STOP and START the TWIN-CAT-2 with a foot switch or other external device if desired. A worldwide universal switching power supply is included for extra power. Reverse the order of serialised labels on a roll. Conveniently rewind labels onto a different core size. With universal Adjustable Core Holders you can unwind from any diameter core and rewind onto any diameter core within the range of 25 to 101 mm in diameter! Great for production shops with varied jobs. Add the Label Inspection option to create a stand-alone Inspection Station. You can also add a Label Counter if you need one. Wind small rolls of labels from larger ones. Conveniently strip the unwanted matrix from die-cut labels for easy disposal as you rewind them in-line with your printer or off-line. Our Unwind / Rewind Stations are available in many different configurations to fit perfectly into your label production. All TWIN-CAT-2 Models operate at up to 125 cm per second.